It's not every day that we look for inspiration. Most days are exhausting, mundane and caught in the routine conundrums. Generally, we can't wait for one such day to get over yet dreaded by the thought of another similar one to begin. almighty forces of the corporate world, that we can breathe fresh air, enjoy the serenity of the dew in our garden, dance in the rain, feel the soothing warmth of the morning sun, and if we are really lucky, meet our friends and family. Most of us though spend it sleeping and grocery shopping! 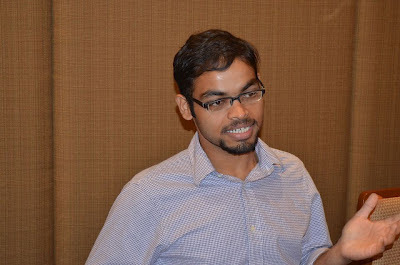 However, on one such weekend, yours truly decided to attend an Indiblogger meet in New York City, the first of its kind, and got inspired by an ordinary man's extraordinary life and achievements. I will be honest here; I didn't go to the Indiblogger meet looking for an extraordinary story. I went to meet the fellow bloggers of my area, network with them, learn about their work and enjoy my Sunday with gourmet food and delightful cocktails at the Junoon restaurant. It is a famous Indian restaurant, in the heart of the City, known to host a lot of celebrities, and quite honestly, way out of the price range of a recently graduated student. Not a bad deal, is it? 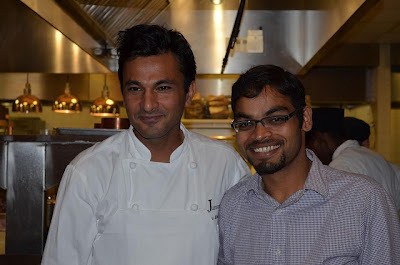 Our host was the celebrity chef- Vikas Khanna. He is famous for a myriad of things- from being on Master Chef to writing books to hosting President Obama. I was welcomed by the very amicable duo of Anoop and Diana. It was a small group of people, mostly in their 20s and 30s. There was an unusual number of food bloggers that made me wonder if we ever realize how hard it is to describe, in words or photos, a plateful of food. The genre probably doesn't get the appreciation it deserves. Some intense discussions about Indiranks followed our brief introductions. Everyone agreed that blogs of different genres shouldn't be rated by the same yardstick. Similarly, frequency of blogging is bound to vary with the genre. A movie review is not the same as a book review and a poem can't be compared with a photograph. While a rank is not our motivation to write, it surely is an impetus to write more and better. 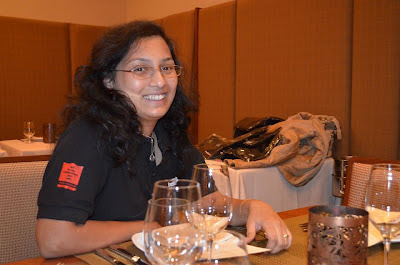 I don' t think it is possible to have a blogger meet without discussing the 3 most prominent bloggers of our time- Saru Singhal, Purba Ray and the caped "alter ego", Blogwati Gee! It began with my enquiry about Saru's chances to attend the event which then moved to their meteoric rise in the "blogosphere". All of them are relatively new to the blogging world but have not only surpassed their predecessors but have set new standards for their peers. Saru has just reached the magical figure of 100,000 in around 15 months of blogging. Now, that inspires us to write more than any rank would ever do! Humility is a virtue, possessed by only a few. Here was a man, who has an international celebrity status, millions of dollars, magazine covers and book deals to boast about and the looks that got him into People Magazine's Sexiest Men Alive list of 2011- but he preferred talking about his grandmother's kitchen. "I have an open kitchen here. People can come in and take recipes. My logic is that had my grandmother shut her kitchen doors on me, I wouldn't have made it". Oh, by the way did I mention, that this millionaire had a dirty gamcha on his shoulder all the time! The kitchen and the spice room at Junoon. He talked at length about his humble upbringing and background. "Once they fired me from a job. I started giving out flyers and walking dogs in Central Park. I would still talk just about food. It hit me then, that I don't know anything other than cooking at all. If this doesn't work out, I am not fit for anything else!" He has spent a lifetime trying to recreate the aroma of his grandmother's kitchen that remains the most endearing memory of his childhood. His simplicity and focus bowled me over. How many of us would have the courage to stand up again if we were trained to fit in just one profession- and we get fired from that job in a foreign country ? He was one step away from either returning back to India or live like millions of immigrants who make no difference to the society. Leaving an indelible mark would not just be a farfetched thought, it would rather be a painful delusion. In my opinion, simplicity comes naturally to a champion chef or you can't survive in a profession where you are as good as your last served plate. He was in a controversy when he gave a statement, around Mother's Day, about how cooking for President Obama "wasn't a big deal"! "Mein to pind ka admi hun ji, mujhe yeh intreview aur media zyada samajh nai ata (I am from a small village, I don't understand interviews, media etc). What I meant was that a mother cooks for her kid, her entire life; Presidents change every 4 years. If I could serve my mother one day, that's an achievement; not serving to a President". Needless to say, the queue outside Junoon on Mother's Day crossed the boundaries of nationality. A nation just got reminded of the importance of Mothers by a foreigner "bawarchi". (I know for a fact he doesn't mind being referred to as "bawarchi" as he insisted GQ to have that word on cover with his picture). 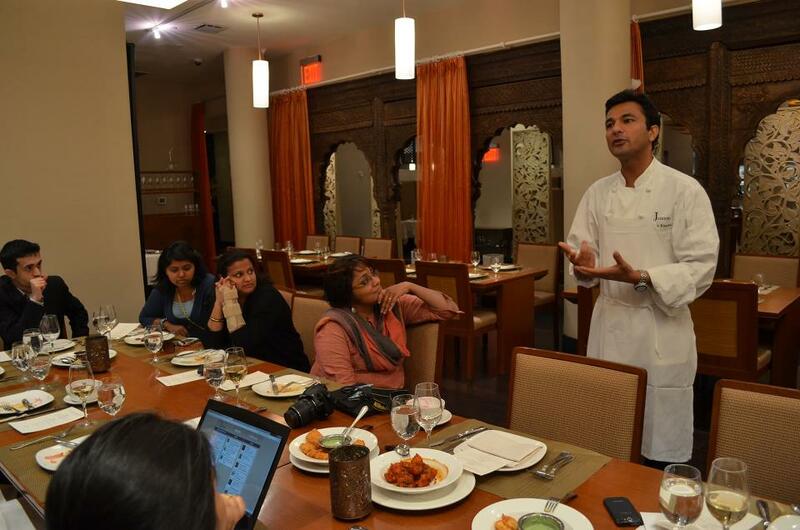 As a fun activity, Vikas brought us a sample of one of his soups and asked us to guess a minimum of 10 ingredients. 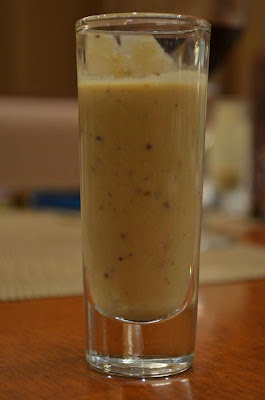 The food bloggers led the group but, barring one, all at least got one ingredient wrong-curd. When the tasting began, someone said out aloud that the sourness is due to curd. No one could think beyond that and even the food experts couldn't beat their preconceived notions. 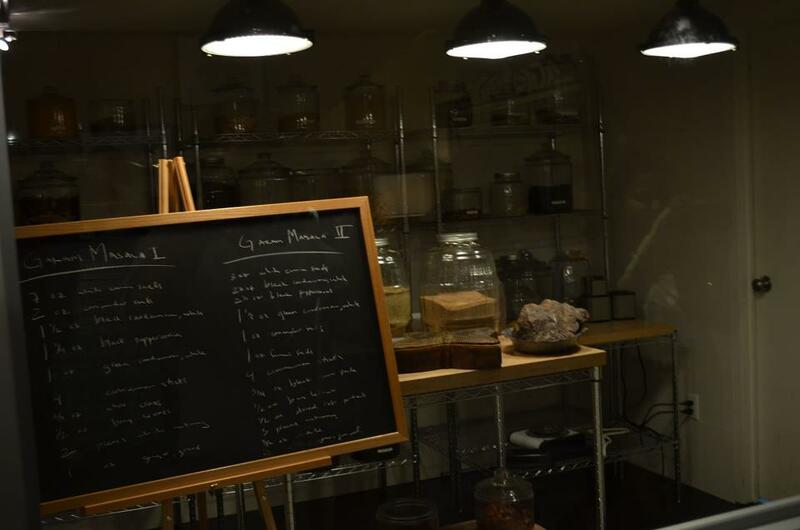 Vikas told us with a hearty laughter, that how a chef has to overcome his natural tastes, step into others' sensibilities and create new tastes, letting go of all his notions. A chef's brain must have a short-term memory with taste to be honest to every recipe. We live a life dictated by pre-conceived notions. Everybody has an opinion that subconsciously prescribes our actions. If we could think like a chef, erasing our notions before every action, and start afresh, it would be a much simpler and happier life. I couldn't help but think how many moments, which could have surprised us, are lost just because our opinionated brain didn't let us seize them. With every sip of the soup, which had pomegranate for sourness, I promised myself to be more spontaneous and less judgmental! An opaque soup had all the colors of life, all we needed were a chef's eyes! The mystery soup and Vikas ji checking our "papers"
It's been eight days since the meeting, but I haven't stopped thinking about the life of Vikas Khanna. I read about him and every piece proved more inspiring than the previous one. It's a simple story- of talent, ambition, commitment, humility and most of all, JUNOON. On second thoughts, these are the things most notably absent from our lives these days. The traits that should be the very essence of being human are becoming virtues that only a few possess. Where are we heading? Certainly not towards the simplicity highlighted by a pind da chulha filled with the intoxicating smell of biji ki rasoi. 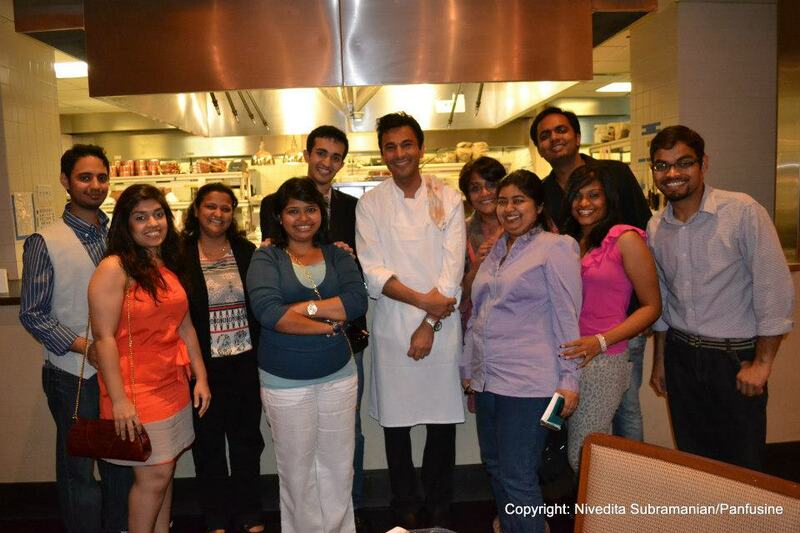 So glad you had a fab time and yes Vikas Khanna is a fab human being. You can actually see the halo around him. It was great meeting your lighter side. Thanks for the nice comments on my space. If by any chance you are around my city surely stop by to sample the goodies from my blog. I am not on twitter, just could not get the hang of it. FB also was kind of slow to grasp for an oldie like me. 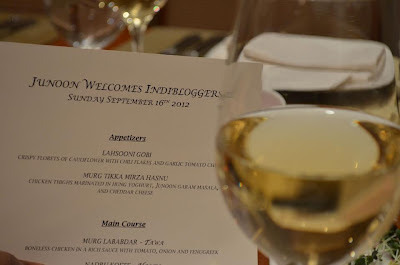 Blogger meets are always fun, and the ones organized by Indiblogger are really worth attending. I have attended three in Delhi (two were on the same day!!!). Wow...lucky u...we cant have those many here...but hopefully we ll have more! I always wanted to visit an Indiblogger meet in India. But sadly never got an opportunity till date. But really nice to read your experience :). It always feels great to meet fellow bloggers and know their stories. I would never known myself that being a chef is so much deeper had he not talked so freely and with so much humility with us. You deserve a mention with the best because you have truly earned it. Your meteoric rise has been phenomenal. I was really looking forward to meeting you. But we are neighbors, may be we ll meet in a mall or something suddenly :) :). I am glad you feel that my body of work has depth and its not just dark :). That was a beautiful round up of the meet! We had a meet in Mumbai on the same day and had taped a video greeting the NYC indibloggers!! Yes! We saw ur video...it was a great gesture! Dude..Its great to see your evolution ..Doing great things..Meeting with great people..Its just all awesome. Blogger meets always hold special memories for me - of finally meeting the person behind the blogs I so love, of meeting and making new friends, people I could never I have connected with, had I not been blogging. It's a beautiful medium, large-hearted to accommodate our eclectic styles and is never shy of applauding new talent. It was my first and i completely agree with ur opinion about them...I would love to attend more! But I must say, right from the start of your post to then end, I felt you enjoyed every moment of it! !